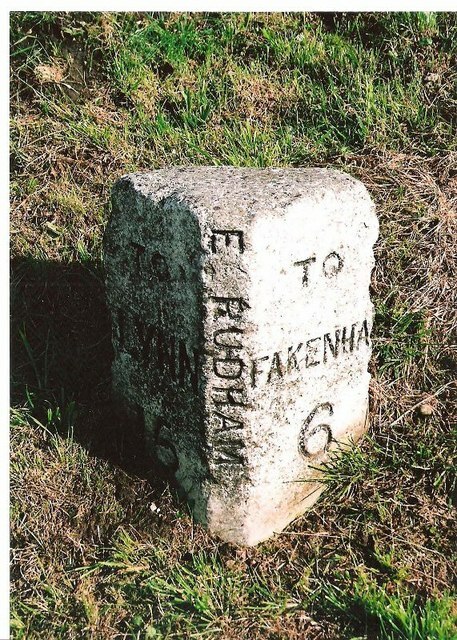 Carved stone post by the A148, in parish of EAST RUDHAM (KINGS LYNN AND WEST NORFOLK District), 80yds E of jct with Eye Lane, at rear of wide verge, on South side of road. Wells stone Erected by the Wells to Fakenham turnpike trust in the 20th century. Inscription reads:- TO / LYNN / 15 : E. RUDHAM / : TO / FAKENHAM / 6 : : . ; . Milestone Society National ID: NO_FKL06. © Copyright CW Haines and licensed for reuse under this Creative Commons Licence.